Broadcast quality color video. 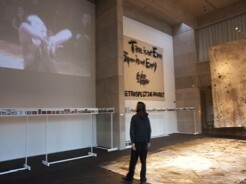 Shot during the fall of 2009 in Wesleyan University, this short documentary follows Eiko & Koma as they construct the first exhibition of their Retrospective and ponder upon questions the project asks. Directed and edited by Joanna Arnow. 10 minutes.